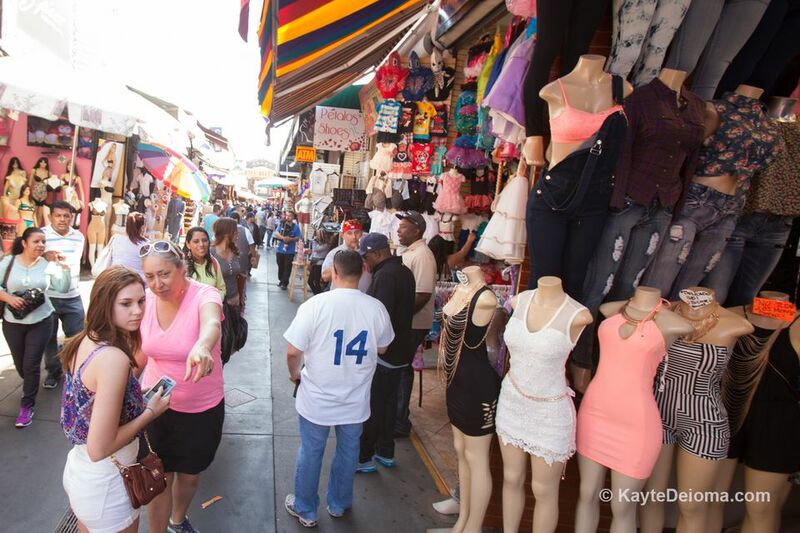 The Fashion District in Downtown LA: Over 1000 outlets of local garment manufacturers and top designers cover 100 blocks of Downtown Los Angeles, divided into themed blocks from men's casual to ladies' formals. Retro Row 4th Street in Long Beach: Where costume designers shop for vintage clothing, 4th Street between Cherry and Junipero. The Grove at the LA Farmers Market is a crossover between mid-range and high-end shopping with good celebrity spotting potential. West 3rd Street is a six-block shopping district between the Farmers Market at 3rd and Fairfax and the Beverly Center at 3rd and La Cienega. It consists of some of the trendiest and most style-forward shops in LA, but it's not totally out of range of most shoppers. Abbott-Kinney Blvd in Venice is a collection of independent boutique shops that originally reflected more of the funkiness of Venice, but has seen some gentrification in recent years. It's still home to some of the most original shops in LA. Santa Monica Place used to be an indoor shopping mall with some uniquely Santa Monica shops. After a 2010 makeover, it is now an outdoor shopping center with big name stores and trendy rooftop restaurants. What they did right - incorporate local designer wares and art at Bloomingdale's and Nordstrom's. Third Street Promenade, Santa Monica: A three-block pedestrian zone of shops and restaurants. Main Street Santa Monica: several blocks of trendy shops, galleries, and restaurants with a bit of British influence. Hollywood & Highland: upscale boutiques and mall staples in an outdoor Hollywood backdrop modeled after a movie set. Old Pasadena: a combination of chain stores and local boutiques in Pasadena's historic district. Americana at Brand: From the same company as the Grove, the Americana at Brand in Glendale is mostly mid-range shops with a few more upscale offerings in a nicely designed outdoor setting. Midtown/West Hollywood - Third Street, Robertson, Beverly and Melrose: One-of-a-kind upscale boutiques draw celeb shoppers. Pacific Design Center at Melrose and San Vicente is the center of the West Hollywood Design District, a Mecca for interior designers. There is also the short Melrose Place between La Cienega and Melrose Ave.
Beverly Center is an upscale indoor mall with over 100 shops, including common mall staples and high-end designers in the Fairfax District of Los Angeles bordering Beverly Hills and West Hollywood. Sunset Plaza is a block of high-end designer shops, boutiques and restaurants on the Sunset Strip in West Hollywood, popular with the A-list.